The Elks are committed to their mission,“So long as there are veterans, the Benevolent and Protective Order of Elks will never forget them.” The Elks take that pledge one step further, and promise service to our nation’s veterans and military members, with a special focus on service to those in need. 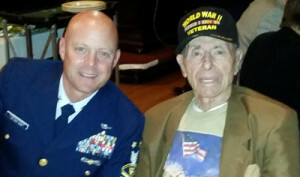 CMC Jason Vanderhaden USCG and Sgt Jim Thompson WW II Vet at the Elks Veterans dinner. veterans, as well as, active duty military personnel serving in the area. We invite prominent military leaders as guest speakers, such as Admirals and Commanding Officers of local military installations. Send care packages to troops serving in Afghanistan, Africa and on deployed Coast Guard Cutters. Welcome Coast Guard Cutters when they return from deployments. In the past year, the Alameda Elks have hosted the crew and families of the Cutters STRATTON, BERTHOLF, and WASESCHE for breakfast and to thanked them for their service. Present a large wreath to honor those who sacrificed their lives for this country at the City of Alameda’s Memorial Day ceremonies. Tent sponsorship at the Stand Down event to provide medical, mental, dental, and other services to help over 500 homeless veterans. 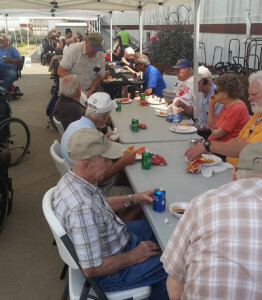 Travel to the Yountville Veterans Home to prepare, cook and serve a BBQ to over 180 veterans. This past year, over 35 Elks members made the trip and also donated to provide a large number of care packages consisting of 1,000 pounds of necessities and goodies for the Veterans. Assist the local U.S. Marines Corps unit with the collection of toys during their annual Toys for Tots Drive. As part of the North Coast Honor Flight, one of our members has taken ten World War II and Korean Veterans from this Lodge, free of charge to Washington, DC in 2014 and 2015, to visit and tour the war memorials built in their honor. If you are a veteran or active duty military and have questions about the benefits of being an Elk, please contact our Veterans Committee.